My family congregated for dinner. After a lengthy debate over what and where to eat, we decided... Chinese food! 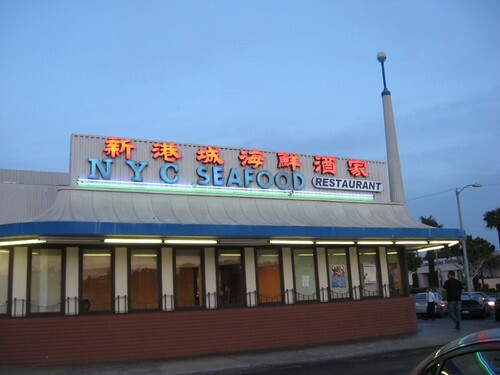 We (well, I had no opinion) all agreed on NYC Seafood Restaurant. The restaurant was pretty busy but we got to our table after passing through the tanks of fresh seafood. It's interesting to have Chinese food with different people. I find my immediate family always tends to order the same things so this was my chance to try new things! 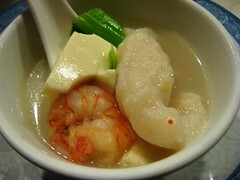 First, we had the mixed seafood with beancurd soup. 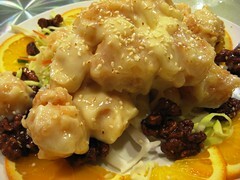 It was quite satisfying with large pieces of fish, seafood and tofu. I sat next to my cousin's little man B who was so amusing. Every time a dish came out, he would say "Try!" and wanted to taste absolutely everything! 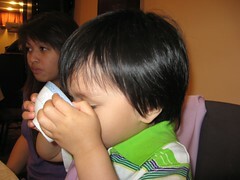 B is really digging the seafood soup! 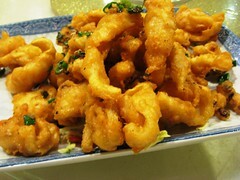 We also ordered the salt & pepper squid (which my family likes to order too) and shrimp walnut. The squid was hot and crispy - we had to dissuade B from digging in right away. The shrimp, coated in a mayo sauce, isn't something I would order but my cousins seemed to really like it. The shrimps were big and sweet. Salt & Pepper Squid and Shrimp Walnut. 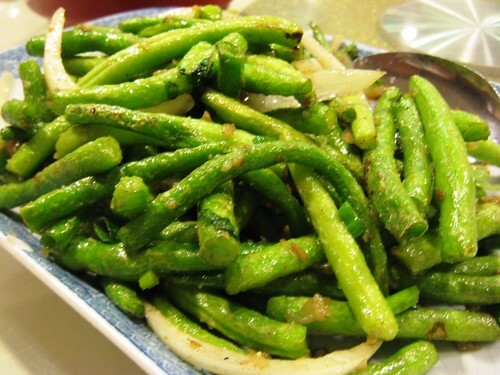 For the vegetable, we settled on pan fried string beans. I actually really enjoyed the beans because they were perfectly cooked and still had some crunch, and were very well-seasoned. I want to try to recreate this dish though I know I would never be able to use as much oil. 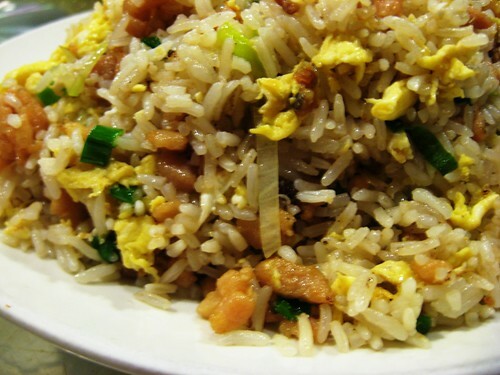 Like my mother, my aunt V also really likes fried rice with salted fish. Surprisingly, the rice was rather un-seasoned. I didn't feel I got the salty bites of fish I was expecting. Not so salty salted fish fried rice. We ordered two other dishes I was not familiar with. 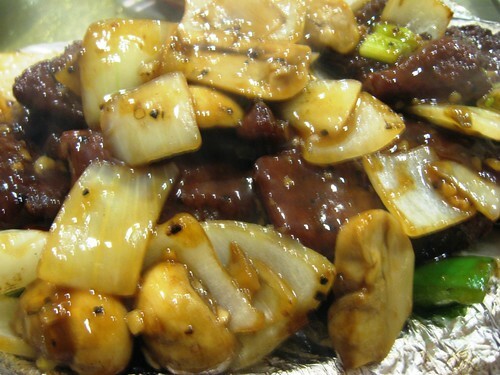 The first, the Cantonese style sizzling steak, was really good. I was really worried about eating a large piece of beef but it was amazingly tender. Great for beef lovers! 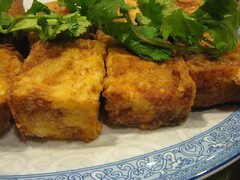 The other dish was crispy deep fried bean curd, that was served with a spicy soy dipping sauce. This seemed to be a favourite among my cousins too! 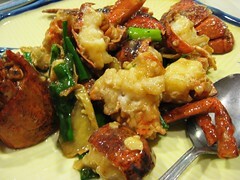 Finally, you can't go to a seafood restaurant without some lobster! We had it two ways: with ginger and scallions, and over noodles. 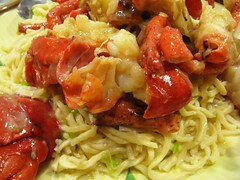 My cousin K had been raving about lobster over noodles all day! She said she'd be happy just eating the noodles. The noodles weren't as expected and were thicker than I expected. By then, I was really full but managed to eat a little and it was good! 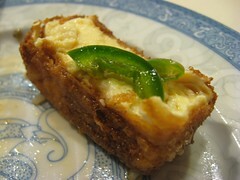 A Chinese meal cannot end without a complimentary dessert. 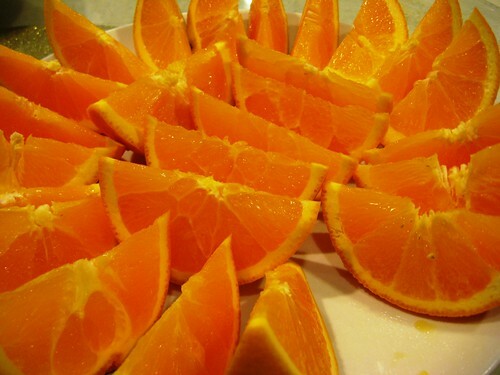 We were served a large plate of oranges that offered a sweet ending to our meal. I was way too spoiled on my trip!